First take the mango ripe and fill it now.And now chop the mango and make puree by grinding in a food processor. Take the mango puree and out of the food processor and pour into a bowl. Now take the chess cloth and pour the sour curd on the cheese cloth and tie and hanged from your kitchen tap for 2 hours. And now the take milk in a sauce pan and place on heat to boil milk.Boil the milk till the quantity become 1/3 of original amount.When the milk come 1/3 original amount turn off the heat and and let the milk to cool down. Now take an ovenproof bowl and the hung curd into it.Spread the curd inside the bowl by using your hand.Add the warm milk,condensed milk and mix them all together very softly.After mixing them add the mango puree to the milk mixture and again mix them softly. And now preheat the oven on 180F and place the mango yogurt mixture preheated the oven for 1 hour or until the yogurt sets. When fill the yogurt settled, then turn off the oven and let the yogurt inside the oven for overnight. 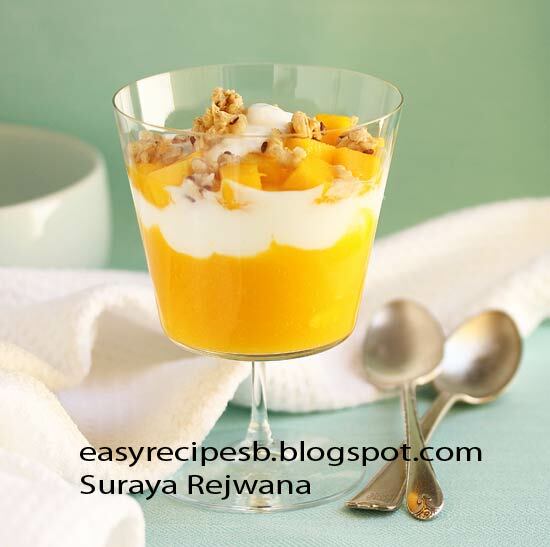 In the morning remove the Mango yogurt from the oven and place inside the refrigerator the chilling. Finally serve this recipe any time.